Enersize has agreed on an energy efficiency agreement with Dürr Systems AG, a part of Dürr Group. The agreement is for measurement, analysis and optimization at Dürr Groups Headquarter campus plant in Bietigheim-Bissingen, Germany. Loudspring owns 35,9% of Enersize. With this agreement Enersizes existing demonstration installation at the plant will now also be used to accomplish real savings. At the time of installation, the plants compressed air system was estimated to operate optimal without any need or possibility for efficiency improvements. With the installation of Enersizes system for compressed air system measurement and analysis it has been clear that there in fact was a substantial potential for improvements, leading to this agreement. The agreement between the parties is a framework agreement for implementing optimizations where the parties has agreed to split the profits equally between the parties. The system installation will have great value for Enersize as a German/European reference installation especially after having been used to accomplish real energy savings. It will also be a base for continued discussions with Dürr Group about possible future co-operations. Dürr Group is listed at the Stuttgart as well as on the Frankfurt stock exchange, has approximately 16.000 employees, with an annual turn-over of 3,5 bn EUR. The group is mainly focused on providing technical systems for production especially to the vehicle industry as well as other manufacturing industries where they have an approximate 50% market share in its product areas. One product example is painting robots with an annual sales volume of approximately 12.000 units. Many of Dürr Groups technologies and products make heavy use of compressed air and are commonly integrated with the plants existing compressed air systems during installation. 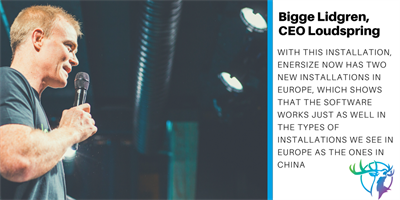 Heinz Dürr is an investor in Enersize as well as a major owner of Dürr Group through companies and foundations. Loudspring is a company group focused on saving natural resources, with offices in the Nordics and California. TheLoudspring companies are active on global markets in five sectors: energy, real estate, fashion, food and manufacturing. Loudspring management consists of company builders combining positive environmental impact with business for over a decade.